In previous Test match trading was disaster as Australia’s odds wasn’t coming down throughout their first innings. So this time I decided to back the underdog – India. First I waited for Australia to settle down and start scoring run. After the 2nd session I entered trading and started to back India at higher odds till it touched 50. 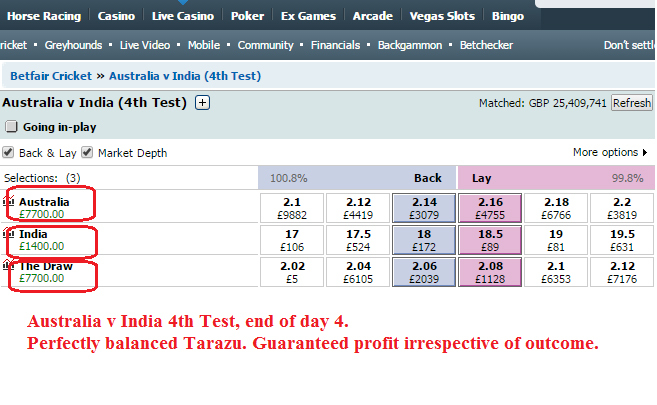 That was the max odds I could back India during Australia’s first innings. I expected India to fight back and score at least 400 runs on this slow pitch which they did. I layed India at 19.00 to green up and exited trading by making guaranteed £7700 profit. This match is heading towards a draw. Australia should declare giving India to chase 348 runs. Smith is on sticky wicket again for making decision on declaration. Australia have ended up in a repeat of last Test match. If Smith decided to bat few overs then it’s going to be a sure draw. If he declares and let India chase then he stand chance for one more victory. Indians on other hand have been pushed in the corner to do nothing but get another respectable draw. £7700 question, how did you predict that India’s odds will go up all the way till 50 and then come down to 19. Wasn’t that risky? bhai samazh me nahi aya. yeh back aur lay kya hota hai? Read my other posts on this blog to gain more insights into sports trading. 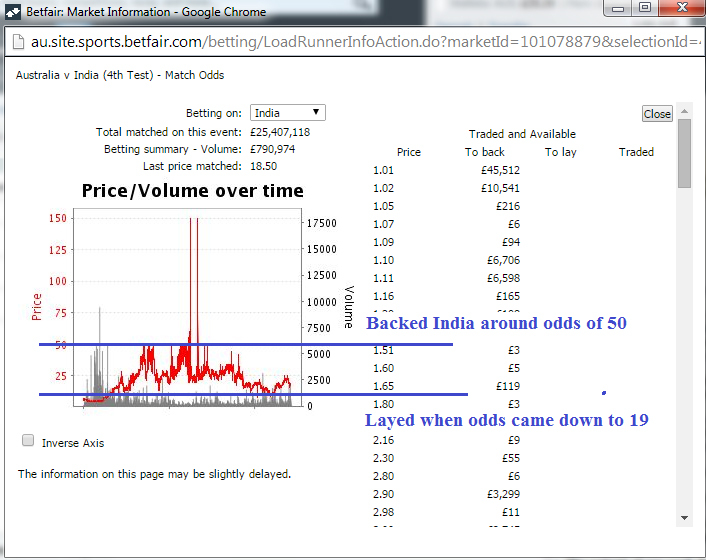 I can see India’s odds touching 150, why did you stop at 50 and why not backed at 150 to gain more profit? Those are fake spikes, I doubt that we could have matched at 150. It happens sometimes. If it was real odds then it could have stayed there for some time before dropping. I got stuck as couldn’t manage to back India at higher odds and it’s not coming down. What do you suggest I should do? Shall I take loss and exit trading or wait? You are in loss anyways so better wait may be India’s odds will come down should they build partnership in their innings. You might want to just take 1 or 2 tick profit and exit. west indies vs south africa t20..
as ur guidance I hav opened account on shrill n betfair..
can u send m Rs.1 k on my skill account.. Send me your skrill account id, you can find it on top right corner after login.